Should Columbus Day Go Away? In 1492, Columbus sailed the ocean blue. And then he got lost, you guys, and ended up in the Bahamas, which he referred to as San Salvador, when he was supposed to be sailing to the East Indies. Whoops! Without even realizing it, Columbus had made a discovery that would open up North America to the rest of the world, and the United States has been celebrating this "discovery" since 1792. 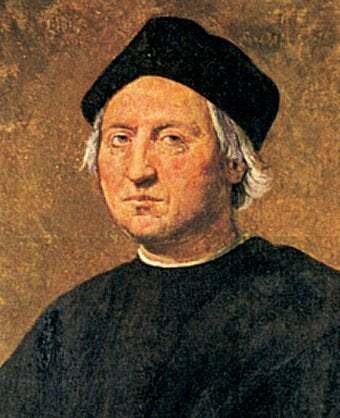 But should the tradition continue?Though Columbus is often credited with discovering the New World, he died believing that he had found India, and his legacy has been tarnished by reports that he systematically decimated the Taino peoples of San Salvador by forcing them into slavery and murdering those who resisted. It's also hard to argue that Columbus discovered anything, as the Vikings had explored North America years before, and you can't quite "discover" a land that is already inhabited. Columbus DID usher in a new era of exploration in North America, but there were many lives lost and many cultures destroyed along the way, something that should not be overlooked. Still, many of you won't have to go to work tomorrow, as the country still celebrates Columbus Day, even as history continues to prove that Columbus wasn't exactly a hero as much as a homicidal explorer desperately in need of a GPS system on the Santa Maria. The controversy over Columbus Day has been raging for years now: should we still celebrate Christopher Columbus? Or are there other people or causes who should be given a National holiday instead? (South Dakota, for example, has already addressed the issue by designating the day "Native American Day.") Or should Columbus Day stand, as long as schools educate children on both sides of the famed explorer?